Homeowners should be mindful of some broad sweeping changes in California real estate. First, solar panels are now required to be installed on most newly constructed homes. Second, on the November ballot, voters can decide whether to expand the current provisions of California Propositions 60 and 90 so that homeowners over the age of 55 can sell their current home and purchase another home while laterally moving their property tax base over to the new purchase anywhere in California. On Wednesday, the Golden State became the first in the U.S. to require solar panels on almost all new homes. Most new units built after Jan. 1, 2020, will be required to include solar systems as part of the standards adopted by the California Energy Commission. 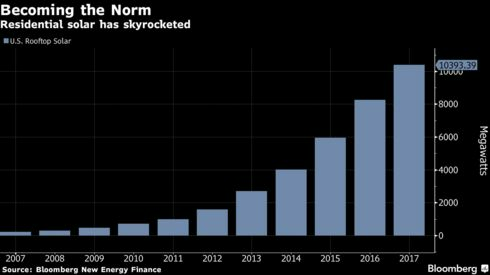 While that’s a boost for the solar industry, critics warned that it will also drive up the cost of buying a house by almost $10,000. 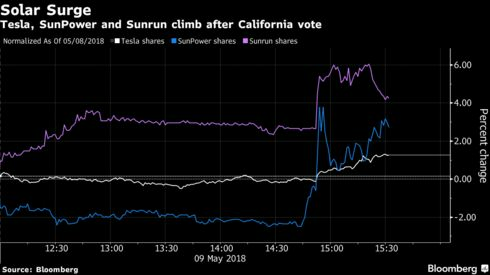 Solar shares surged on the decision. Homebuilders fell. The move underscores how rooftop solar, once a luxury reserved for wealthy, green-leaning homeowners, is becoming a mainstream energy source, with California — the nation’s largest solar market — paving the way. The state has long been at the vanguard of progressive energy policies, from setting energy-efficiency standards for appliances to instituting an economy-wide program to curb greenhouse gases. The housing mandate is part of Governor Jerry Brown’s effort to slash carbon emissions by 40 percent by 2030, and offers up a playbook for other states to follow. Perhaps the biggest winner will be San Francisco-based Sunrun Inc., the largest U.S. residential-solar installer. Oppenheimer & Co. raised its price target Thursday for the company to $12, from $10. “We see Sunrun as the biggest beneficiary considering its entrenched position in the state,” Sophie Karp, a New York-based analyst at Guggenheim, said in a research note. Sunrun rose as much as 15 percent to $11.34 Thursday, the most intraday since November 2016. First Solar Inc., a U.S. panel manufacturer, gained as much as 6.3 percent. KB Home, which has significant exposure to the California market, fell as much as 1.7 percent. The U.S. had 10.4 gigawatts of residential solar power at the end of last year, up more than sixfold from five years earlier. The industry started slowing in 2017 amid policy changes and efforts by some companies to shift their strategies. Tesla Inc.’s Francesca Wahl, senior associate of business development and policy, was among the company representatives to back the mandate at the meeting Wednesday, and expressed support for provisions that will also promote wider use of energy storage systems. California’s solar policy will exacerbate another critical issue in the most populous state, where high housing costs are seen as a drag on the economy that also contributes to rising social tensions. California’s economy added 2.3 million jobs over the past five years. Over the same period, the state issued permits for fewer than 480,000 new residential units, or about one home for every five additional workers. The new policy applies to single-family houses and multifamily units that are three stories or less, and there are some exceptions for homes that are too shady. Homebuilders will probably try to pass on the costs to customers, Carl Reichardt, a San Francisco-based analyst for BTIG LLC, said in a phone interview before the vote. Big homebuilders like KB Home and Meritage have an advantage because they’ve been offering solar homes for years. Smaller builders will have a harder time managing the new requirements, he said. Installing a solar system and complying with other energy-efficiency measures required will add about $9,500 to the cost of a new home, according the the California Energy Commission. That would be offset by about $19,000 in expected energy and maintenance savings over 30 years, the commission estimates. Bloomberg New Energy Finance analyst Colleen Regan described California’s decision as “admirable but misguided.” The standard isn’t the best way to curb the state’s greenhouse-gas emissions and could exacerbate the steep ramp-up in solar power production that California’s grid operator is already grappling with at midday. “It’s also a policy that very clearly is picking winners, and California would be better off focusing its efforts on the real source of the problem — greenhouse gases — rather than favoring one zero-emissions technology over others,” Regan said. The energy commission meanwhile said the standards would cut greenhouse-gas emissions tied to home energy use while saving residents money over time. The California Building Standards Commission will need to adopt the rules as a formality. The state adds about 80,000 new homes a year, and the California Solar & Storage Association estimates that about 15,000 include solar power. The Energy Commission says that the average home system uses 2.5 kilowatts to 4 kilowatts of panels, so the additional 65,000 new systems would add as much as 260 megawatts of annual demand in the state — about the size of one large solar farm. SunPower Corp. expects the rule will increase demand for residential solar in the state by about 50 percent. The San Jose, California-based company makes panels and develops solar systems ranging from rooftops to large, utility-scale power plants. It’s unclear how much major solar installers like Sunrun and Vivint Solar Inc. will benefit, said Joe Osha, a San Francisco-based analyst at JMP Securities. They typically target existing homeowners rather than companies building new homes. Some of the world’s largest solar-equipment manufacturers in Asia stand to gain in the long-run. President Donald Trump slapped tariffs on solar equipment imported into the U.S. in January, and that could mute some short-term gains. SACRAMENTO, Calif., May 18, 2018 /PRNewswire-USNewswire/ –The Homeowners for Families and Tax Savings for Seniors Committee issued the following statement in reaction to the announcement by California’s Secretary of State that the Property Tax Fairness Initiative has been declared eligible for the November 6, 2018, General Election ballot. When passed, the measure will eliminate what amounts to a moving penalty that severely restricts the ability of seniors, disabled residents, victims of natural disasters, and homeowners living on contaminated property from being able to relocate due to unfair property taxes increases. “REALTORS® and California voters believe that homeowners who are seniors, disabled, victims of disasters, and homeowners living on contaminated property deserve the opportunity to move to safer, more practical homes without being penalized,” said Steve White, President of the California Association of REALTORS® (C.A.R. ), the initiative’s sponsor. White noted that the Property Tax Fairness Initiative simplifies what today is a patchwork of inconsistent county property tax laws. Passage would help homeowners, age 55 and older, to limit the property tax increases they would face when moving to a new home, while granting the same protections to disabled homeowners, people whose homes have been destroyed by a natural disaster, and those who discover their home is located on contaminated property. The initiative allows people to move across the state while including safeguards to ensure that people continue to pay their fair share of property taxes. Furthermore, economic studies have shown the initiative can increase property transactions and increase economic activity. “Our goal to provide property tax fairness is within sight, and REALTORS® look forward to building a diverse statewide coalition of voters across California, including senior groups, advocates for people with disabilities and people who have faced property tax spikes after losing their homes to natural disasters or whose homes are found to be on contaminated property. We have the resources and grass roots strength to eliminate the property tax moving penalty, strengthen neighborhoods, and improve housing opportunities for all Californians,” White concluded. With respect to solar panels, buyers and sellers of homes should be aware that some leased systems require the new owner to continue paying the lease payments unless the lease is negotiated out of the purchase contract. I had a case where the sellers ended up taking the solar panels with them to their new home because the buyer did not want to take on lease payments and the buyout of the solar contract was exorbitant. If you are considering constructing a new home, you should be aware of what options you have with solar systems. Before you embark upon your project, it would be wise to investigate the full array of solar contract options and choose one that will be economical for any end user. With respect to the California Association of Realtors’ sponsored initiative, I am on the fence about this. There is a severe shortage of inventory in many parts of the state and on our mid-peninsula many people over the age of 55 would appreciate the ability to move from the bay area to a less congested area and move their tax base to the newly purchased home. However, while this initiative might incentivize some people to move, capital gains is still the greatest stumbling block to selling a bay area home so I am not sure how many 55 and over homeowners will take advantage of this expanded advantage to seniors. What I find troubling is the inherent unfairness of Proposition 13 which has had the unintended consequence of creating a downward spiral of inventory by keeping people in their homes for extremely long periods of time. The buyers of homes in the bay area (and other inventory-challenged areas of California) are bearing what some may consider an unfair burden to support the community and schools. I personally do not know what the answer is to restore fairness in home ownership in areas such as ours where home prices continue to soar upward due to lack of inventory and competitive bidding. It will be very interesting to see how voters react to this initiative.